Cotyledon barbeyi Schweinf. ex Bak. This is an easy to grow succulent plant with attractive shiny red flowers. 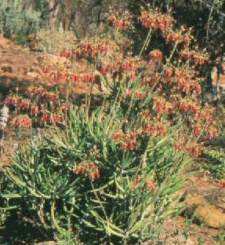 Cotyledon barbeyi is a robust, much branched, perennial, succulent herb that grows to a height of 1-2m. Its leaves are mostly basal, fleshy and vary from broadly ovate to lanceolate and even linear. Leaves can be smooth or covered with glandular hairs. 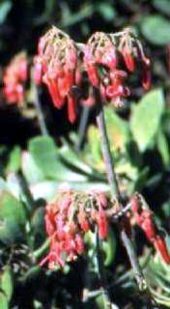 This plant has pendulous red tubular flowers with a satiny sheen. The flower tube always bulges between the calyx lobes. This is the main character that distinguishes this plant from Cotyledon orbiculata. Flowering occurs between March and September. It is naturally distributed in woodland and scrub in the Northern province and Mpumalanga in bushveld and rocky outcrops. It also extends beyond the low-lying regions of the former Transvaal into Natal and Swaziland. Cotyledon barbeyi is common in these areas and it has been found in some eastern parts of Africa to Ethiopia. The genus Cotyledon comes from the Greek word kotyle which means 'cavity'. Species name barbeyi was given after William Barbey (1842-1914), a Swiss philanthropist and botanist. Bees and birds are the main pollinators. The seed is extremely fine and is carried away by wind and rainwater. Cotyledon barbeyi is very attractive and suitable for frost-free gardens. It is also a good plant for low maintenance and waterwise gardening as it can withstand a long period of drought. At the Witwatersrand National Botanical Garden they can be found growing in the succulent section of the garden often flowering from May to July. This plant has been reported to be toxic to livestock. Cotyledon barbeyi can be cultivated from both cuttings and seed. It can take a couple of years to flower from seed; therefore, cuttings remain an alternative way to produce well-established plants. Cuttings can be planted in washed river sand and there is no need to use root stimulating hormone powder. Rooted cuttings should be planted in the planting bags to grow a bit before transplanting in the garden. Plants can be drastically pruned after flowering in order to promote more branching.